How to book Raja Ampat accommodation. Easily. Directly with the owners. Use the accommodation page search filters and see the guest reviews at the foot of each homestay page to decide where you want to stay. If you are sure of the dates you want, simply submit the booking request form provided on each homestay’s page. If you want more information than is provided on a homestay’s page before requesting a booking, then you will need to contact the homestay by phone (or email where available). Decide whether you want to book via the website or by trying to phone or email the homestay. Don’t request bookings by both methods. Complete confusion about your booking is the most likely outcome of using both methods. Read on to understand how the Stay Raja Ampat booking system works, and why it is different to others you might be familiar with. 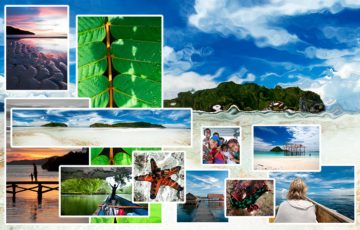 First things first: Stay Raja Ampat is a non-commercial, not-for-profit website. Use of the Raja Ampat accommodation booking request system is free for both you and homestay owners. We don’t charge any commissions or fees to homestays on our website or for them to be connected to the booking system. The purpose of the booking system is to make it easier and quicker for guests who don’t speak Indonesian to arrange a stay with homeowners who don’t speak English. That’s all. You’re still able to contact homestay owners directly if you prefer. The booking system uses SMS to communicate your request in Bahasa Indonesia to the homestay. Some homestays do not have a telephone signal and sometimes owners may have no credit on their phone, so the booking system gives homestays 48 hours to respond. Most responses are much quicker than that, but we can only guarantee a response within 48 hours of receiving your request. If you don’t need to ask questions and have decided which Raja Ampat accommodation you want to book, and the dates you want accommodation for, simply fill out the form and click the “Send booking request” button. The system will take care of the rest. Easy! You’ll receive an email from us acknowledging your request. If you have provided an Indonesian mobile number, you will also receive SMS notifications at each step of the process. You’ll receive an email/SMS the moment the homestay accepts or declines your request. If the homestay owner declines your request or doesn’t reply within 48 hours, we’ll let you know by email/SMS and provide you with some options for what to do next. If your request is accepted and the homestay needs a deposit to confirm your booking, they will contact you about it. Very few homestays require deposits or prepayment. Ones that do will contact you directly within a day or two of confirming your booking. A week before your scheduled arrival we’ll email/SMS you a reminder containing a cancellation link in case your plans have changed. Two days before your scheduled arrival, your homestay will be sent an SMS reminding them of your booking. A week after your scheduled departure we’ll contact you by email/SMS to give you the opportunity to provide feedback to your hosts. Don’t call or send SMS messages to the number our SMS messages come from. The system is fully automated – there’s nobody there to respond to you. System Emails: Homestays do not receive copies of booking system emails. If you reply to a system email, it will come to us. We are not agents and are not based in Raja Ampat. Everything we know about each homestay is on that homestay’s page. If you need further information you’ll have to contact the homestay directly. It translates your request form to Bahasa Indonesia and sends it by SMS to the homestay. It notifies you by email (and optionally by SMS message*) as soon as the homestay sends our system an SMS accepting or declining your booking request. It notifies you within 48 hours if the homestay does not respond to your request and provides you with options for what to do next. It sends a reminder in Bahasa Indonesia to the homestay owner 48 hours prior to your arrival. It provides the ability to easily cancel your booking if your plans change. It provides you with all homestay contact details for further enquiries or communication with homestay. It provides the homestay owner with your contact details for further communication or to arrange deposits or pre-payment where required. *Optional SMS notifications are only available to Indonesian (+62) numbers. If you don’t have an Indonesian phone number, leave the phone field empty on the form. All guest notifications are in English language. Contact details for each homestay can be found at the bottom of each homestay page. Most homestays cannot return calls or send SMS messages to international numbers. Email addresses are provided for homestays who have access to it. Allow around a week to hear back. 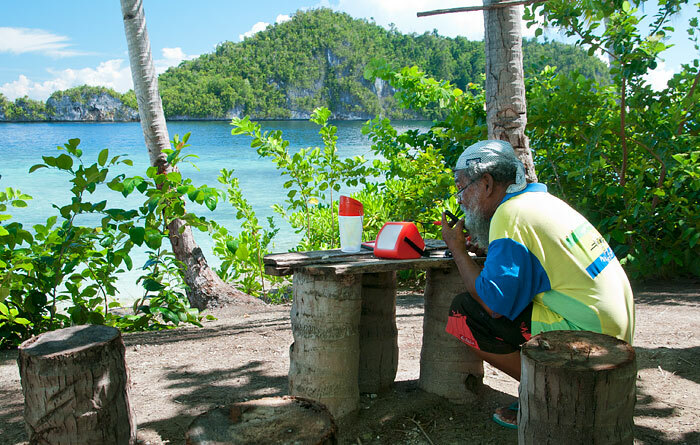 Telecommunications in Raja Ampat are unreliable and some homestays are in areas without telecommunication access. It can be some time before your email is able to be received and replied to. Very few homestays are able to call or send SMS messages to international numbers, so you’ll need to call them to get in touch. Although mobile telephone coverage in the islands is remarkably good for such a large and remote area, there are still times when the service can fail, a connection won’t be good or the person you are trying to contact does not live in a network coverage area. Keep trying! If you have some Bahasa Indonesia there won’t be any. If you don’t, you may find it hard going as some homestays have minimal English. There’s usually someone around who can help though. If you hear the word “toong-gu” or “sebentar” you’re probably being asked to wait until an English speaker can be brought to the phone. The features list on each homestay page shows if English is spoken. You can also use the accommodation page search filters to quickly find all homestays where (at least some) English is spoken. The only internet service available in the islands is supplied via satellite or the mobile telephone network. These technologies are unaffordable to the majority of guesthouse operators and guides on the website. Consequently, most of those who use email can only check it when visiting Sorong or Waisai, so don’t be disheartened if you don’t hear back immediately. You should probably allow a week before a follow up email, so don’t leave your planning to the last minute! If you are unable to make a booking in advance via telephone or email you shouldn’t worry too much. Go anyway! The chance of all Raja Ampat accommodation being fully booked is essentially zero. If you can’t confirm an accommodation booking prior to arrival, or if you want to make enquiries and are having trouble contacting the homestay concerned, the Raja Ampat Homestay Information Center in Waisai will be able to help. By the way – if you discover a place that’s not listed here and you’d like to do your hosts a favour, please contact us with as much information about the guesthouse and its owners as you can and we’ll add them. Everyone wants to see photos, so it’d be great if you could include some to share – thanks! thanks a lot for really amazing work that you do here. I am about to book a Homestay and I need a pick-up from Waisai but in the request form there is no option to specify what time we will be at waisai and what time we need to be picked up by the homestay. How can we solve this issue? There are only two ferry arrival times per day Mansour. In your booking confirmation email, you will find a recommendation that you send an SMS message to your homestay when you board the ferry In Sorong, so that they know which one to meet. If you can not do that, or if you can not find your host when you arrive at Waisai, then go to the Homestay Information Center and they will help you. thank you for helping everybody plan their stay at Raja Ampat. I am thinking about going there in April for about a week and I’ve noticed that all of the homestay that I like are around Kri. If I take the ferry from Sorong to Waigeo, how long will it take me to get to Kri? Would I be travelling in a small boat? I can’t imagine how high the waves are in that area. As described on our how to get to page, the ferry ride from Sorong to Waisai takes about 2 hours. Then it’s a small boat ride to Kri, which takes about 40 minutes, depending on the boat. You don’t need to worry about waves on the crossing from Waisai to Kri. Ich möchte Raja Ampat sunrise homestay VIP Bungalow von 23.Jänner bis 2.Februar für 1 Person buchen. Mit dem Formular auf der Seite des Homestays ist das nicht möglich. Hello, I made a booking on on the 2nd december. Until now I didn’t got an email from you. Did I have to try it again or did it just take time? We acknowledged receipt of your booking request 19936 on December 1. The homestay confirmed your booking almost immediately and a confirmation email was sent a few minutes later. Perhaps these messages went to your spam folder? If you can not find them, please use our contact form to let us know and we will forward you copies. the group that I’m traveling with are staying at Yenaduak at the end of our stay 26-29 december. My question is if we can reach Sorong by boat from Yenaduak the same day the flight is? Our flight is at 2 pm the 29th of december so can Yenaduak provide a boat transfer for us the same day as our flight? Yes, as stated in the Transport/Getting there section of Yenaduak’s page, Yenaduak can provide transport direct to Sorong. muss ich für 2 Personen zahlen oder nur für mich? Almost all homestays charge per person, but some do charge a slightly higher single occupancy rate if you are in a room by yourself. Prices are clearly shown at the top of each homestay’s page and will say if a single occupancy rate applies. If no single occupancy rate is mentioned, then you would just pay the per person rate. Hi, need to book an additional day in a homestay. Have already booked that day somewhere else, but I am hesitant to cancel this booking without knowing the availability in the desired in homestay. What to do? Thanks in advance for the advice. Your only option in that situation is to directly contact the desired homestay to find out about availability. Bonjour , j’ai une réservation à Yenkoranu Homestay en Avril 2019 et j’ai envoyé un émail en demandant s’il fallait verser un acompte sans réponse à ce jour !!. Comment les prévenir de l’heure d’arrivée du ferry Sorong via Waisai ?.. Yenkoranu have confirmed your booking and do not require a deposit. You requested a pickup from Waisai when you made the booking, so they will send a boat to Waisai to meet you on your check-in date. 2. Cancel your existing booking using the cancellation link provided in your confirmation email, then request a new booking, but do not select the Waisai pickup checkbox. Do I have to pay a deposit to my chosen host or will I pay all amount when I meet my host on the island? Depends on the host Jan. Some require deposits to confirm bookings, some don’t. If you book through this website, hosts requiring deposits will contact you directly after they have confirmed your booking. If you have not already seen it, please read this information about how our booking system works. Is possible to dive there ? Of course. See this page Riccardo. Many thanks for such a helpful website. A quick query – how does your home-stay know which ferry you are on to pick you up (i.e. the one that departs Sorong at 9am or 2pm)? As advised in booking confirmation emails, we recommend you send them an SMS message when boarding the ferry in Sorong. If you’re unable to do that (or find they are not there to meet you when you arrive) then the Homestay Information Center will help. Hello, I’m in awe of your detailed and informative website and admire the effort you’re making to assist the home stays of RA, very worthwhile indeed. I have one simple question please. Can you give me any idea how far in advance it would be wise to book for January/February? How far ahead to book depends very much on where you want to stay. If you are happy to stay anywhere, then you should be able to find a room available without booking at all, even in January. The Homestay Association Information Center at Waisai can organise accommodation for guests arriving without bookings. I cannot book or send any inquiries because the place I send a mail to like 2 weeks ago ist not replying! Not a very good system – I cannot book! Can’t be sure without knowing which homestay you are trying to contact, but using the website booking forms will almost always get a quicker response than emailing. 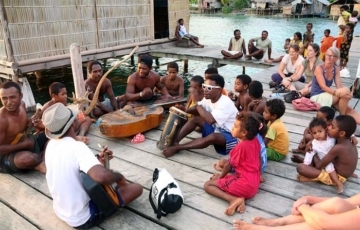 Telecommunications in Raja Ampat are unreliable, telephone signal is only available in some areas and data connections (which are only available over the mobile phone network) are frequently offline. The booking system we provide is the best available method of getting around those problems. We’ve just arrived in Manado and decided to og to Raja Ampat. We hope to fly to Sorong in a day or two. What would you recommend – that we try to book a homestay via your website/bookingform or go to Waisai and work it out from there? Sorry for not replying in time to your query. We’ve been without an internet connection for the last 2 weeks. Booking using the website booking forms is usually the quickest and easiest way to make a booking, but (as long as you’re not wanting to stay at one of the more popular homestays) arriving without a booking and using the Waisai Homestay Information Center also works. My girlfriend and I send booking for a week on Yenkorano Homestay from 18/1 25/1, we arrive tomorrow to Sorong, we need quick answer if you can hIndonesianLaura number is 082146776246. Thank you very much. Just sent you an email about this. Please check your spam folder if you can’t see it in your inbox. Hi, im planning on visiting in march and wish to stay at two different homestay. I cant find information on travelling between homestays. Can i count on the first homestay helping me arrange transport to the second homestay? Or how do i arrange it? Thanks for a great site! Yes, it’s easy to arrange transport from one place to another. The easiest way is to ask your current host to take you to the next, but you could also ask your host to call your destination to arrange a pickup if that’s better for any reason. So, if you book using the website booking forms, you only need to select the “Waisai pickup” checkbox for the first place you will be staying at. I’m planning a trip to Raja Ampat in November 2018 for my family of 2 adultsadults and 3 children..can please advice on the home stay. You will find all the information you need to organise your trip linked from our step by step guide page. We are a honeymooners couple, and we are very excited to go there. We are going there from January 10th to January 18th. Do you recommend to stay in one place or two? We are looking a private room and private bathroom. I already contact diferents resorts, but most of them are very expensive. Which place do you recommend? and which accommodation? You should be able to find the answers to any other questions you have in the information linked from our step by step guide. Hello Rosario , how’re u? We’re two also traveling to Raja ampat those days. Did u choose where to stay? Maybe we can be in touch for sharing the boat ride From the main island Waisai to one of the island. I trying to book with Yenkoranu Homestay (Kri North Coast). I visit Raja Ampat next week. I was planning to dive and snorkel in Kri Island. By the way, I read that I can see the dugong in Batanta area. Is it true? It is my dream to see a dugong. If I can see the dugong, I want to stay Batanta. But if it’s just a big fortune, I’ll just stay at Kri. Yes, it’s true, sun. Most people who spend time at Batanta see dugongs. They are wild animals though, so there’s no guarantee that you’ll see one, but you would be unlucky not to as long as you spent at least a few days looking for them. Hi, I am Pablo, i am arriving to Raja Ampat next march 2018. I am interested in doing some scuba diving and relaxing at paradisian beaches . Do you know where I culd stay taking into account that I am travelling on my own and in a backpacker style? Do you know if homesatys organize groupal excursions to get around other islands and so, it would be chaeaper? I know it is expensive but anyway, i am desperate for some information about this. Our step by step guide provides links to answers to the questions most visitors ask. All homestays can organise trips to any place you want to go, but it is up to you to find others to join and share the costs with. 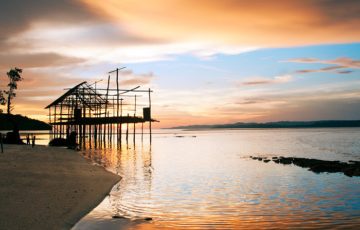 Kri might be your best choice as it has great beaches, dive centers and it’s easy to meet other guests there. The only large boat that goes anywhere near Yenkarom is a public boat from Sorong that departs once a week on Fridays at 1600, and arrives at Arefi around 2200. It returns to Sorong on Saturdays. You will be fine booking a Waisai pickup with Yenkarom. The windy season usually starts to abate in mid-September, and Yenkarom would not make the crossing if the conditions were unsafe. ok thanks a lot for the info :) so i changed my plan i will stay at Batu lima homestay …it s easer and sheaper …only 30 mn by boat from Waisai …perfect for the first week we ll see after to go to Kry …i got a indo phone and my friend speak indo …so i just need to send a texte for the booking ?? Do you know a place called Cove Eco Resort in Raja Ampat? Apparently stays in an island called Yeben. Counting on your support. We have never visited that resort and all we know is that it is not Papuan owned and is not a member of the Raja Ampat Homestay Association. I´ve seen there are some Homestays you can book and pay with agoda. You know if it works well? I´m wondering if there is trouble with the payment or overbooking!? With only a couple of exceptions, all those Agoda listings have been created by scammers with no connection to the homestays they have listed. Note the vastly inflated prices! We have no idea what the result of booking one of those would be, but it’s an absolute certainty that if the the homestay concerned received anything at all, it would only be a fraction of the price paid by the guest. Much safer to use the booking forms provided on this site. Doing so is communicating directly with the homestay concerned and is much cheaper.